The Intel Core i7-8086K is a high-end desktop processor with six cores based on the Coffee Lake architecture and was announced in mid 2018. It is a limited edition for the 40 year X86 anniversary and at the time of announcement the fastest Coffee-Lake CPU. The processor clocks at between 3.7 and 5 GHz and can execute up to twelve threads simultaneously thanks to Hyper-Threading. According to Intel, the CPU is manufactured in an improved 14nm (14nm++) process. The i7-8086K is comparatively easy to overclock thanks to the unlocked multiplier. 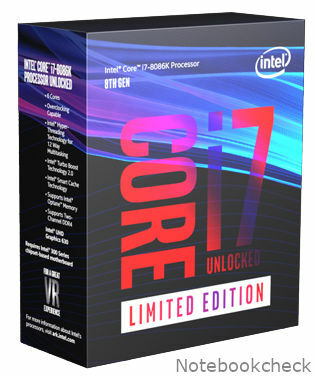 Compared to the cheaper i7-8700K (-66 Dollars) only the single core Turbo clock speed is faster (5 GHz versus 4.7 GHz). Due to the two additional cores, performance has increased by almost 50% compared to the Core i7-7700K when all cores are in use. Compared to the cheaper Core i7-8700K, the 8086K offers only a higher single core Turbo Boost and therefore in daily usage and gaming not faster. As a high-end model, the i7-8086K is suitable for the most demanding applications and games.